Every year, new jobs open up, and new people are credentialed to fill those jobs. But how close is the number of vacancies to the number of applicants? It turns out in the Austin MSA, the answer depends quite a bit on the type of job you're looking for. 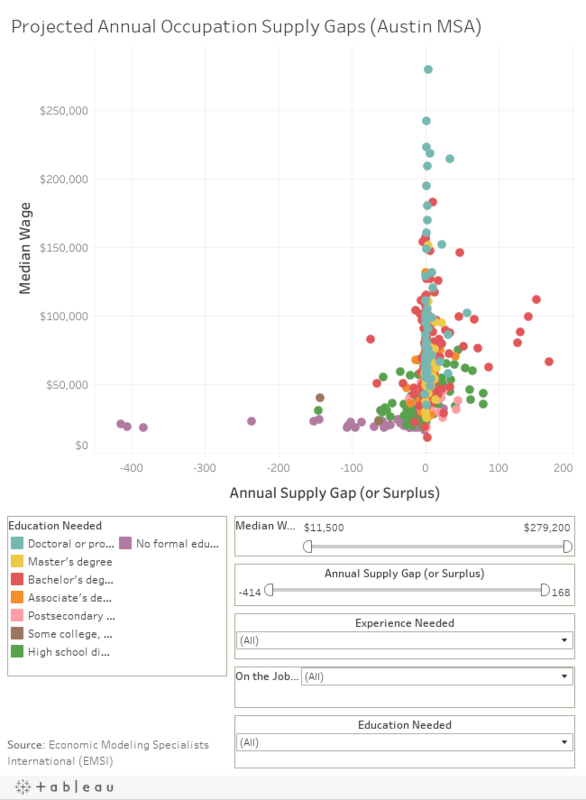 The interactive graphic below shows occupation gaps (i.e., the farther left on the horizontal axis, the greater the oversupply of labor) according to average wages and education needed. You can also filter results by the amount of training, experience, and education required for individual occupations. Have a look below! (And once again, dots on the left are occupations with an oversupply of labor. Dots on the right have labor shortage - a gap). 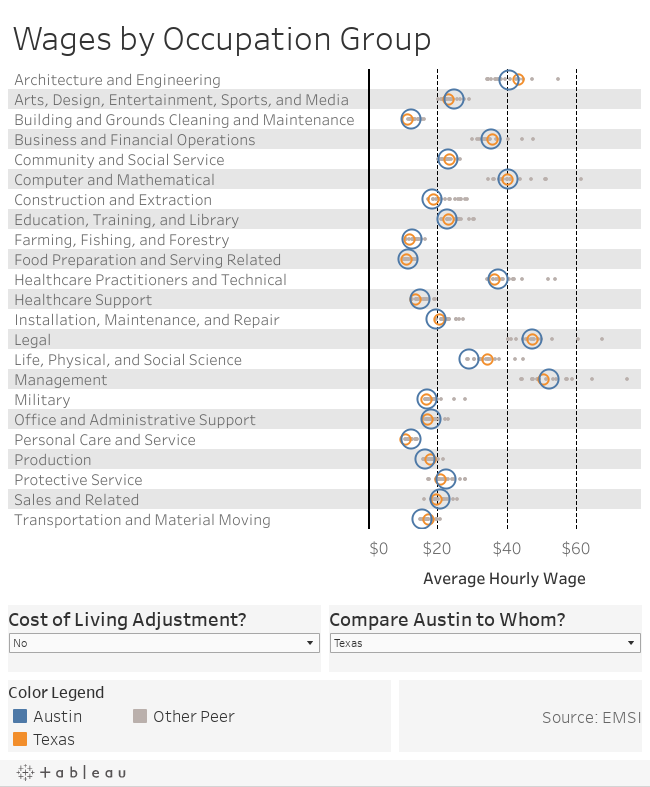 How do Wages in the Austin Metro Area Compare to Peer Regions? Ever wondered how wages in the Austin Metro Area compare to similar regions? Us too. The following graphic shows how local wages by major occupation group compare to a range of peer regions. Use the dropdown menues below the chart to select a comparison region and toggle whether or not the graphic controls for cost of living. One note - the cost of living adjustment considers cost of living at a metro area scale. When controlling for cost of living, the Austin MSA appears to pay wages among the highest of the peer regions analyzed. However, some of this effect is driven by the low cost of living in many of the communities surrounding Austin and Travis County. Limiting the cost of living calculation to a smaller area, such as only the counties along the IH-35 corridor, would have the effect of bringing cost-of-living-adjusted wages in the region more in line with other peer cities. Data Points is a blog dedicated to policy and planning issues in the Capital Area of Central Texas. It is produced by staff at the Capital Area Council of Governments (CAPCOG).